On one hand Rio is currently going through its worst recession in 100 years, but on the other hand thousands of people have been given jobs because of the summer games. One thing is for sure, it will bring an influx of foreign visitors, as well as encouraging investment in transport and infrastructure. The Summer Olympic Games 2016 will take place from August 5th to August 21st It will be an enormous spectacle with 306 competitions in 42 different sports. You could be one of the 3.6 billion people watching the Games on TV or mobile device or be a guest in a city which won the election to host the Olympics over Chicago, Prague, Tokyo, Baku, Doha and Madrid. Having the event in Rio is sure to make for an exciting and colorful event, full of spectacular viewing with and electric atmosphere. ‘Live your passion’ is the theme for the games. It matches the vibe of Brazil perfectly, and sums up everything that it stands for. 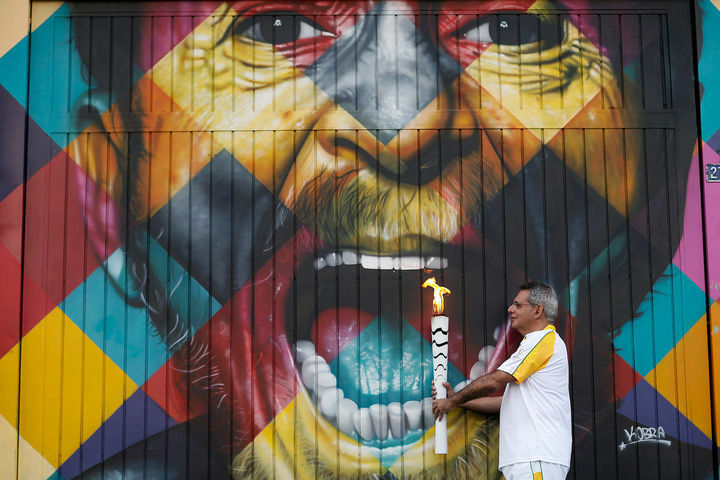 Rio will become the first Brazilian, and South American, city to host the games, that's why the city is determined to make the games a blast. Created by dr-discount.nl | Use the following HTML code to share the infographic on your site. The Olympic Games go way back to ancient Greece times. Many traditions from today´s Olympics have their origins in this ancient era. The concept has survived until the modern day and is carried out by countless athletes every 4 years. Some traditions did not manage to survive to the current games. In the very beginning the only discipline was a 200-meter sprint and, well, the participants had to run completely naked! Later, the Games featured other running events, jumping events, discus and javelin throws, boxing, wrestling and equestrian events. The athletic festival was held every four years at the sanctuary of Zeus in Olympia, Greece. The Olympics were also of great religious importance. Besides the sporting events ritual sacrifices honoring Zeus and Pelops, represented an essential part. As the Romans gained power and influence in Greece the importance of the Olympic Games started to decline. Today the Olympic Games are a huge, worldwide recognized event that is continually growing in popularity. A total of 7.5 million tickets were available for purchase and about 3.6 billion people are expected to tune in on their television! This equals to almost half of the worlds population! The Summer Olympic Games 2016, which will take place from August 5th to August 21st (17 days) in Rio de Janeiro. It will feature around 10,500 athletes from 205 different nations, in 306 competitions in 42 different sports. This year’s Summer Olympics are in fact the first ones to be hosted by a country located in South America. So far 6 have been held in North America, 16 in Europe, 3 in Asia and 2 in Oceania, making a total of 27 so far. This means a great deal to South America as a continent and especially to Rio as the hosting city. Seven cities were originally proposed as candidates for 2016´s games: Chicago, Prague, Tokyo, Rio de Janeiro, Baku, Doha and Madrid. Quick fact: The chosen location of olympics is always a city, rather than a country. To make the official motto “Live your passion” become true for everyone involved, the city took major efforts in every organizational aspect. 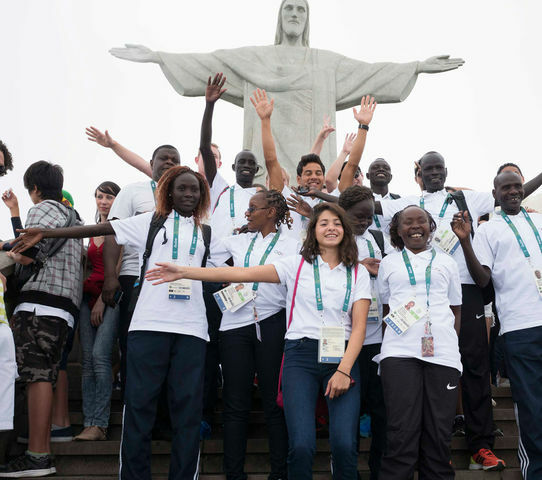 Imagine 8,000 employees, 85,000 third party employees and 45,000 volunteers involved working for the Olympic Committee Rio 2016, which equals a total of 138,000 workers! This huge workforce will make it possible for you and everyone else to enjoy the Olympics as much as possible. Not only that: 85,000 soldiers and policemen will do their job to keep you safe, so everyone can enjoy the event in peace. Fun fact: Rio's taxi drivers have the opportunity to sign up for free English lessons, provided by the Rio 2016 Organizing Committee. Hosting an Olympics is an expensive business. Despite the fact that it may bring the country money afterwards, you need to pay cash upfront! The estimated costs of the Olympic Games in Rio are about 37.6 billion Brazilian Real (€10.24 billion Euro - $11,44 billion USD). This is the equivalent of around 3,056,716,417 Big Macs. Even though there is likely to be a huge financial boost for Rio, many economists are quite skeptical about the economic benefits of hosting such Games. The argument is that the costs of events on this scale are just too high to make any profit in the long term. Besides the critical view on financial factors, some controversies exist about the forceful eviction of many citizens. Due to the construction projects, approximately 77,000 Brazilians have been forcibly evicted from their homes between 2009 and 2015 only. Nevertheless, there have been some positive (economic) effects in the years leading up to the Games, which might persist for several years afterwards, although not permanently. 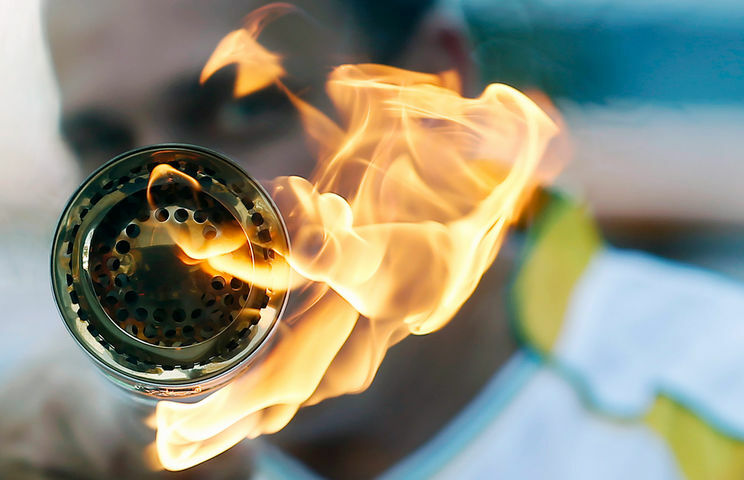 This means the Olympics will still create some opportunities for Rio to take advantage of. The calculated outcome of the Games regarding the Brazilian economy is predicted to reach R$ 102 billion. In addition, many jobs in 55 different economic sectors will be created due to the mega event! The Olympics are spread over 4 districts: Barra de Tijuva, Copacabana, Deodoro and Maracana. Every district will be used for different disciplines. The Barra de Tijuca will host most competitions, including boxing, table-tennis, badminton, gymnastics and most aquatic events. The district of Copacabana will be used for rowing, sailing, athletics, canoeing, kayaking and beach volleyball. Deodoro will host modern pentathlon, shooting, equestrian, cycling, canoe/kayak slalom and fencing. The Maracanã district is home of the Maracanã Stadium, which will be used for the Opening and Closing Ceremonies as well as for some soccer matches. Now that you know the basics about the city, let's take a look at the different districts. First we got Centro or Downtown. It is the historical and finance center of the city and houses many of Rio's famous sites like the Paço Imperial or the Candelária Church. If you want to dive right into the action during the Olympics and do sightseeing while waiting for the next big sports competition you are in the right place here. Next, there is the Southern Zone, containing several districts and also Rio's famous Atlantic beach coastline. It is the wealthiest part of the city and also the best known. Most people associate Rio with this part of the city, as it represents the typical image people have of Rio de Janeiro. If you want to chill at the beach or check out a beach party you've found the right spot. Also some Olympic events like sailing and beach volleyball will take place at the famous beach of Copacabana, which is located in the area. In case you want to check out the Olympic Opening or Closing Ceremonies you should go to the Maracanã stadium, which is located in the North Zone of the city. Originally built as a football stadium it is able to hold about 80,000 to 90,000 people. Besides Maracanã, the North Zone of Rio has many other things in store like the really famous Christ the Redeemer statue. Nonetheless be a little careful when exploring this part of the city. Many of Rio de Janeiro's 1000 slums, which are called favelas, are located in the North Zone. It is really dangerous to go there as a tourist, so it would be best to avoid these neighborhoods. Explore the area where most of the Olympic competitions are going down: The region of Barra da Tijuca, located in the West Zone of Rio, will host most competitions like boxing, table-tennis, badminton, gymnastics and most aquatic events. It is the most recently modernized part of the city and is still growing. Besides that, these 4 districts and the whole city itself has tons of cool things to discover and activities to try out. Get lost in this unique atmosphere! Rio de Janeiro is the city with the second biggest population in South Americas and one of its most lively places. What do you think of when you think of Brazil or Rio in particular? Of jungles, the Amazon or something entirely different? Rio is known for many things: The famous carnival of Rio, for landmarks like the Sugarloaf Mountain and the giant statue of Jesus Christ, soccer, it's jaw dropping natural scenery, Samba of course, as well as for the beautiful beaches such as Barra da Tijuca, Copacabana, Ipanema, and Leblon. Every single of those add something to the unique flavor of the city. Can you already feel the energy? Created by dr-discount.nl | Use the following HTML code to share the Rio 2016 Olympics infographic on your site.